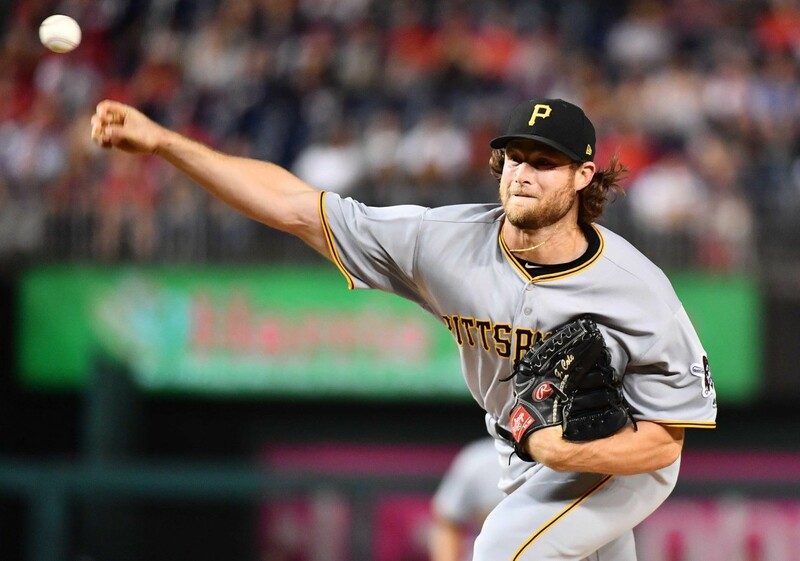 Whether or not the majority of Yankees fans would sign off on a trade for Pittsburgh Pirates’ ace, Gerrit Cole, the possibility exists. Chronicling the assets presumed to leave New York for the cost-effective starter gives you a picture of how foggy details around the “progressing” negotiations seem to be. On December 16, the Pirates were pushing for top prospect Gleyber Torres. A week later, four more Yankee prospects were tossed around in some combination: Estevan Florial, Justus Sheffield, Clint Frazier, and Chance Adams. Lately, the name swirling around Cole-to-New-York rumors morphed into Miguel Andujar, yet some speculate the Yankees offered packages around Clint Frazier for similar, cost-controlled pitchers like Chris Archer and Michael Fulmer. As you can tell from this spotty progression of events, no crystal ball exists to help fans determine how upset or thrilled they should be in regards to another pinstriped hurler. That crystal ball also escapes us when guessing how Gerrit Cole’s evolution will proceed come 2018. Now 27 years old, the former number one overall pick in 2011’s MLB Draft took under 200 innings of seasoning across three levels of the minors before debuting in 2013. When Cole’s slider use ticked north of 20 percent and he subsequently posted a 3.10 DRA in 2015, expectations vaulted into perennial-ace territory – and rightfully so. The Pirates, coming off a 98-win season, had their years of prior struggle to thank for the draft pick used on Cole, and the long night finally turning to day for a struggling team. But the best laid plans often go awry. 2016 was an injury-riddled year for Cole, with minor velocity blips and a substantial dip in Cole’s swinging-strike rate (down 1.7% to 8.5%, well below average). That opened the floodgates on question marks coming into 2017, yet Cole did his due diligence to squash some concerns. While I often shy away from omitting a chunk of a player’s career when looking ahead, Cole’s 116 innings in 2016 with his injuries create some confusion around what proportion of his struggles were driven regression versus health. For that reason, comparing Cole’s 2015 to his 2017 has its limits, but can still provide insight into the evolving tendencies of the potential Yankee. The most noticeable difference in Cole’s results revolve around how often he relinquished home runs. His home-run-to-fly-ball rate jumped from 6.5 percent in 2015 to 17 percent in 2017. While this issue emerged regardless of the opposing hitter’s handedness, left-handed hitters were homering at an absurd 1.7 times per nine innings come the end of last season. Considering Cole’s ability to neutralize lefties and righties at relatively even rates in 2015, this deviation from 2015 makes me wonder what changed. I started, as I often do, with what the pitcher altered in his repertoire. The former UCLA Bruin became less of a fastball-dominant pitcher. While Cole’s sinker usage stayed steady versus lefties and righties, his four-seamer ticked down about seven percent across the board. How he reallocated his pitch selection is particularly interesting. Instead of pushing towards his dominant offspeed pitch that catalyzed his hype in 2015, Cole’s slider, the righty embraced his changeup, further bolstering an already deep repertoire. While this alteration started during 2016, the pitch drew nearly even in overall usage against left-handed hitters with Cole’s slider – something I doubt many would have predicted after his dominance with his slider in 2015. A: Cole was ineffective to left-handed hitters. B: Cole’s changeup became a featured offspeed pitch to left-handed hitters. Ahh, If only it was that easy. The funny thing about Cole was his changeup became his most effective pitch in 2017, trumping his slider when looking at Fangraphs “pitch info pitch values.” A pitch that was Cole’s worst offering in 2015 per this metric, became his best in 2017 relative to his other four pitches (four-seamer, sinker, slider, curve). Cole acknowledge the elevated use of his changeup as well. Noting in this MLB.com report that he wanted to feature the pitch more in 2016, but injuries bogged his feel for the pitch down; 2017 emerged as the opportune time to execute this plan. Brooksbaseball pitch movement numbers seem to agree. Comparing Cole’s changeup to its 2015 version, the pitch’s horizontal movement increased. For right-handed pitchers implies more run inside to right-handed bats, increased by nearly one inch. While that minor change is not likely a major component of the increased effectiveness, it shows that the pitch changed its tendency ever so slightly, which I venture a guess has to do with this elusive “feel” for the offering. On top of that, consider Cole’s nearly pristine location of the pitch to left-handed hitters. Yet this deliberation doesn’t present a reason for the collapse of Cole’s ability to keep the ball in the park and neutralize, even marginally, left-handed hitters. It merely presents backing that the effectiveness of Cole’s changeup might be here to stay. Another attempt I took to discover the reasons behind Cole’s emergent platoon issues deals with the use, movement, and location of Cole’s fastball, which became the main pitch attributed to the home run barrage against Cole in 2017. While pitch use and movement presented no proprietary insights, before even looking at Cole’s four-seamer location, I took a guess that he elevated the pitch more to both handedness of hitters, or became inconsistent with his location of the pitch. My latter thought holds some merit. The larger, dark-brown area represents Cole’s 2017 four-seamer location, while the pinpoint concentration just off the center of the plate in the subsequent picture is Cole’s 2015 four-seamer location. 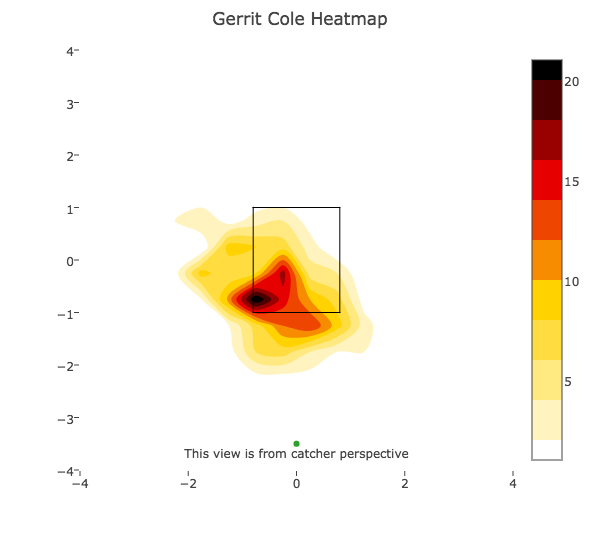 The larger blot of brown shows, to some extent, that Cole didn’t locate as consistently, possibly making this pitch less effective, which we can confirm, and playing at least some role in his home run spike, which is harder to confirm. This could be another “feel” issue, as Cole moves towards becoming an offspeed-dominant pitcher, but with BP’s grading of Cole’s four-seamer at 70 with a future of 75 back in 2015, I remain skeptical that the pitch deteriorated that much after once being touted so highly, even after only two seasons. While another 1,000 words could easily be scribed regarding Cole’s various usage decisions between 2015 and 2017, and with that might come a clearer answer for his struggles. Often the process of trying to discover a culprit regarding an issue can provide some insight; I often enjoy the journey as much as the result. This journey makes me interested to see if Cole alters his usage again to either handedness of hitter in 2018. He could call back to the shape of his 2015 slider, which if combined with his present-state changeup would make me a proponent of acquiring Cole for a high price. Or Cole could continue to tend towards off-speed dominant and never regain the effectiveness his fastball possessed in 2015. Or it could be a mixture of both, with a balance reached that produces an in-between result. A mixture of Cole’s dominant 2015 and less-dominant, but still effective 2017, could still produce north of 3 WAR. My interest for Cole will come in 2018 whether or not he dons pinstripes for 2018. Statistics via Baseball Prospectus (DRA, general stats), BrooksBaseball (Pitch usage), and Baseball Savant (Location, GIF data).